Home / Projects / Tall Ships, Sharp Swords, and… A Jewish Pirate? Come aboard this milestone Jewish pirate film! Tall Ships, Sharp Swords, and… A Jewish Pirate? 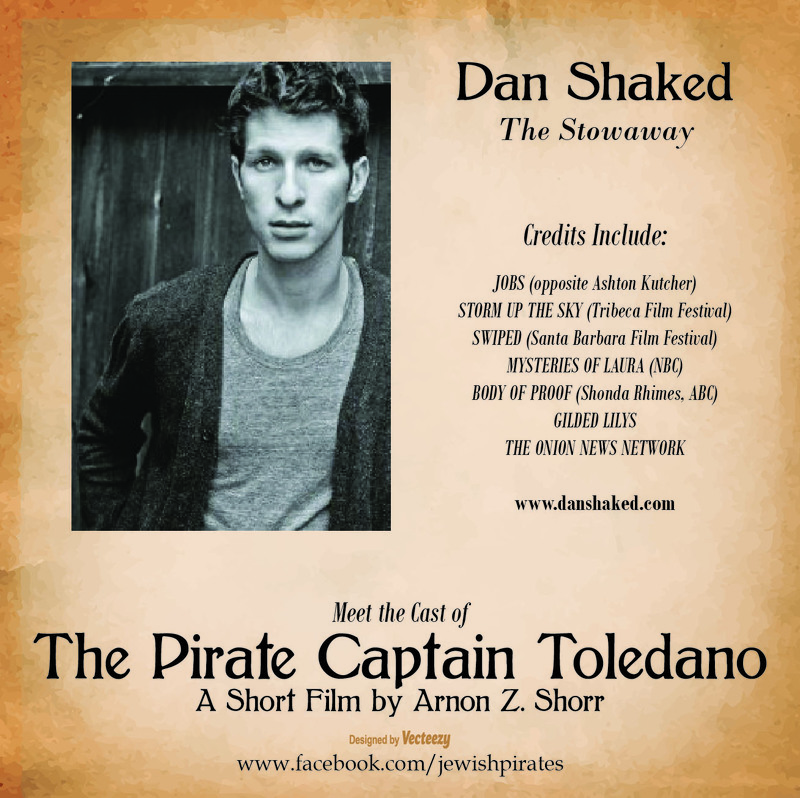 Come aboard this milestone Jewish pirate film! THE DVD IS AVAILABLE FOR PURCHASE! Thanks to the incredible generosity of our Jewcer supporters, and to the hard work and dedication of dozens of cast and crew, “The Pirate Captain Toledano” has been selected or honored by 40+ film festivals and competitions around the world. I’m honored to report here that it is now available on DVD! YOU CAN STILL COME ABOARD! 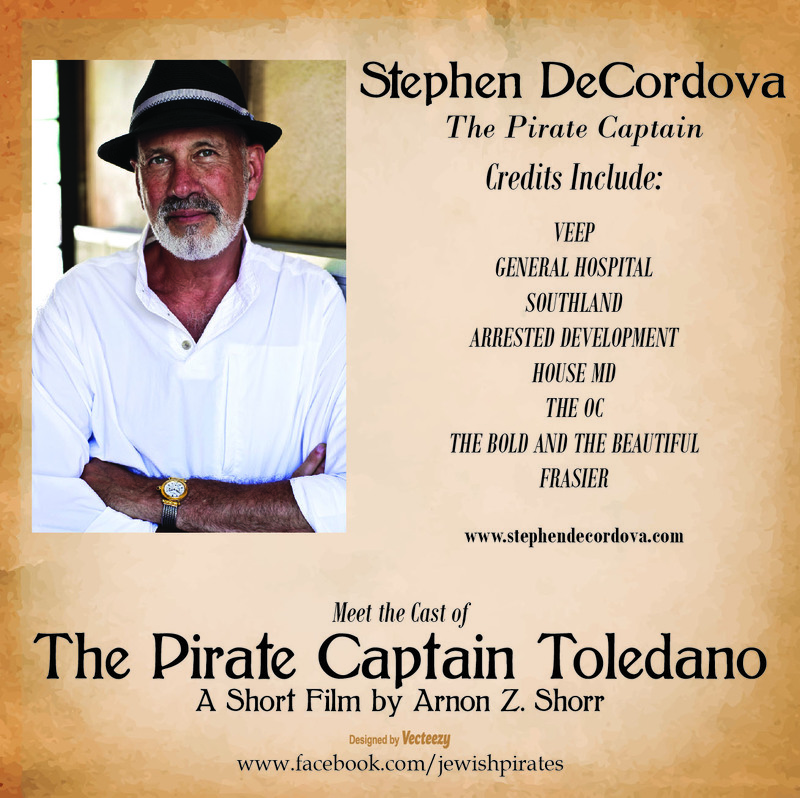 Thanks to over 150 generous contributors, we met our fundraising goal and shot “The Pirate Captain Toledano” in December. This film is turning out better than anyone expected, and deserves a bigger promotional push. If you’d like to make an additional contribution, you can help send the film off to more festivals in the coming year. Additional contributions at this stage will help cover an expanded festival run – keep the contributions coming so we can bring this film to as many screens as possible! Why raise more money? Didn’t you already raise the money you need? Well, yes, we did raise the money that we needed, plus a little bit. And we shot the film on-budget, too. But the original budget was sufficient to support 10-20 film festival submissions, and now that we’re seeing the film, it’s looking so great that we really ought to submit it to more festivals than that. How much money do you really need for festivals? Film festivals charge anywhere from $15 to $50 per submission. Some of them require that the film be delivered in special screening formats that can cost a lot to produce (many festivals will accept the film on BluRay, but better fests may insist on a Digital Cinema Package, or DCP, which is a hard drive that contains the film in a particular encoding format. DCPs can cost hundreds of dollars to create.) Once the film is accepted to festivals, we want to promote those screenings as much as possible, which means printing postcards and posters, and, where possible, attending the festivals themselves. Attending the local fests can be easy, but if we are accepted to any of the big festivals outside of LA, there may be travel and lodging expenses involved. Some festivals actually require that filmmakers attend in order to qualify for awards. $50 buys a pack of postcards or a couple of posters to help promote the film at the festival. Why bother with festivals at all? This film looks amazing, and will have the most impact when seen on the big screen. We want this film to really resonate, to really move people, and it simply won’t pack as much of a punch if all we do is put it up online. And frankly, the big screen is where we want YOU to see this film! So if you want the film to come to a theater near you, help us submit to your local festivals. If you contribute at least $50, leave a note for us with what big cities are near you, and we’ll try to submit the film to a festival in your area. I’ve been looking to tell a Jewish Pirate story for the last couple of years, ever since reading about the history of Inquisition-era Jews becoming pirates to get revenge against Spain. There are so many great characters in that history, so many stories, it was hard to sift through it all and settle on just one story to tell. Then, the story of Captain Toledano and his stowaway hit me all at once. It’s simple, and for the first time on-screen, will break the mold and introduce pirate fans to a whole new type of pirate: the Jewish pirate, whose motive is greater, darker and deeper than gold. Here’s the story: One quiet night under sail in the Caribbean, the Pirate Captain Toledano is presented with a young man who was found hiding in the ship’s hold. The stowaway is a Jewish refugee from the inquisition who wants to become a pirate. The captain has to decide whether to make the stowaway a pirate, or to make him walk the plank… Let’s get this movie made, so I can show you how the story ends! 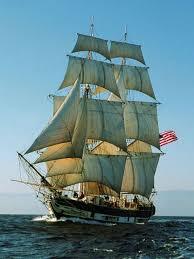 We could shoot our film on this ship, but only with your involvement! So, that’s where you come in. Presumably, most of you don’t have a pirate ship, but you might have a little money, and you certainly have quite a few friends and acquaintances (who might also have a little money). If we pool our resources, and get our friends to pitch in too, we can hire our cast and crew, rent our equipment and costumes, pay for a proper ship for a day, and this film can get made the way it needs to be made! So, come aboard! There are many ways to get involved – pick the contribution level that interests you the most, and let’s get going! I’m looking forward to sharing this wonderful adventure with you. In case you’re wondering, I’ve directed plenty of stuff prior to this – over 100 shorts, webseries episodes, media projects, even a small handful of micro-budget features. Some of my work has even been mentioned in the press (remember when The Wall Street Journal published a front page story about Jewbellish? I produced or directed most of the videos they wrote about!) I have years and years of directing experience, so you can be confident that every dollar you commit to this project will be met with every ounce of talent, experience and dedication that I can bring to bear, as well as the talent, experience and dedication of the many friends and collaborators whose work will elevate this film. Together, we will create an outstanding piece of cinema. It is my hope that when you see it, you’ll feel the same sense of pride that I will feel at having created something truly great. It takes many people and lots of resources to make even a short film. We’re really lucky to have a few fascinating individuals and organizations involved. Stay tuned, and we’ll tell you about some of them in the campaign updates. I want to make a very special mention of the Ocean Institute in Dana Point, California. 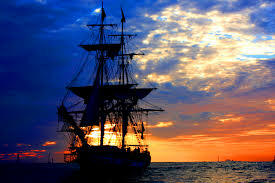 We are currently in discussions with the wonderful people there about shooting this film on their ships. 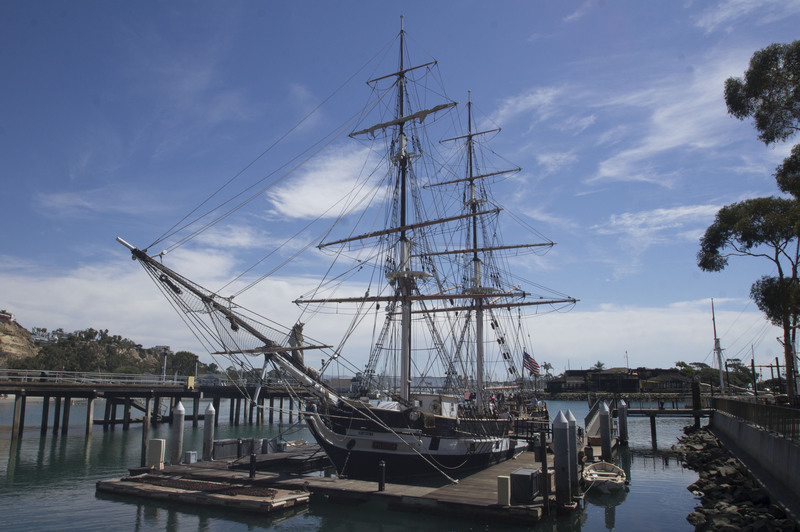 In addition to all the great marine and maritime education that they do, the Ocean Institute maintains two beautiful tall ships, the Brig Pilgrim (which was used by Spielberg for a scene in “Amistad”) and the Spirit of Dana Point. If the pieces fall into place, we’ll be shooting “The Pirate Captain Toledano” on those stunning watercraft. How You Can Come Aboard! Want to keep up-to-date on our progress? For this contribution level, you’ll get updates from us through the Jewcer platform from now until the film’s release. In addition to the “Stowaway” perks, we’ll send you a PDF of the movie’s poster (probably early in 2017). If you want to see this movie before the wide audience, this is the reward level for you! In addition to the “Powder Monkey” perks, we’ll send you a password-protected link to the film after its Los Angeles festival premiere. You’ll have the ability to watch the film as many times as you’d like for one month! If you join us at this contribution level, we really want to shout our gratitude from the rooftops. In the 21st Century, that’s done online! Provide us with your Twitter or Facebook handle, and we’ll tell the world that you helped make this film possible. You will, of course, get all of the “Rigger” perks, as well. In addition to the “First Mate” perks, if you live in the greater Los Angeles area (including parts of Orange or Riverside Counties), I will come to your house and treat you (and up to five friends) to a coffee tasting! I received Coffee Master training at Starbucks, and was once able to differentiate between Latin American, African and East Asian coffees by taste. There’s something really special about seeing your name up in lights. For your participation at this level, we will list you in the “thanks” section of our end credits, so you can have that special experience of seeing your name up on the screen. You also get all of the “First Mate” perks, of course. This is an EXCLUSIVE new perk! In addition to the “Master Gunner” perks, you will be granted access to an online ADVANCE SCREENING of the completed film, after which you’ll have an opportunity to participate in an online Q&A with the director. What’s better than seeing your name in the end credits? Googling yourself and finding your name on the Internet Movie Database! At this contribution level, we will list you with a “Special Thanks” credit when we post the film’s cast and crew to IMDb. You will get all of the “Master Gunner” perks as well, but you’ll be listed in the credits in the “special thanks” section instead. If you really love giving feedback, this level is a really special and unique opportunity. We will send you a password-protected link to the rough cut of the film, and will give you a chance to give us your feedback. This is a rare opportunity to meaningfully participate in shaping this film. You get all of the “Carpenter and Surgeon” perks, too. For more information, check out The Ocean Institute website. This is a special one-of-a kind perk: In addition to all the “Sailing Master” contribution level perks (PDF of script, PDF of poster, Social media shout-out, Access to film online (for one month, after the LA Premiere), “Special Thanks” in credits and on IMDb, Opportunity to give feedback on the rough cut, Sea Star membership at the Ocean Institute) you also get two whale watching tickets from the Ocean Institute in Dana Point, CA! If you get involved in this project at this level, we really want to thank you face-to-face. The filmmakers will treat you to dinner at Steven Spielberg’s mother’s kosher dairy restaurant in Los Angeles (really!) You will also be credited on screen and on IMDb as a “Patron Producer”, and will receive the “Sailing Master” perks (“Patron Producer” credit replaces “Special Thanks”) (A note: if you don’t live near Los Angeles, you’ll have to get yourself to this fine city somehow – we, sadly, can’t cover your transportation or lodging). This is the pinnacle of generosity and commitment for which there’s no more appropriate reward than being on set with us when we shoot the film. You will also be credited as “Executive Producer” in the film and on IMDb, and will receive all of the “Quarter Master” perks, as well (“Executive Producer” credit replaces the “Patron Producer” credit). (A note: if you don’t live near our shooting location in Southern California, you’ll have to get yourself there somehow – we, sadly, can’t cover your transportation or lodging). This is a really special perk that comes courtesy of the Ocean Institute in Dana Point, CA. In addition to the regular Ship’s Captain perks, you will get a CATERED DINNER FOR 20 aboard the Brig Pilgrim, one of the beautiful tall ships at The Ocean Institute. The dinner comes with some entertainment for the kids (and kids-at-heart), and we’re even working on making a Kosher caterer available. This perk needs to be scheduled with the Ocean Institute, and does not include transportation. There’s a rich and complex history of Jews in piracy, especially after the Spanish Inquisition. If you’d like to learn more about it, check out one of the only books on the subject, “Jewish Pirates of the Caribbean” by Edward Kritzler. This stuff is really important, so it should be very large print, but it’s also boring, so we’re keeping it small. 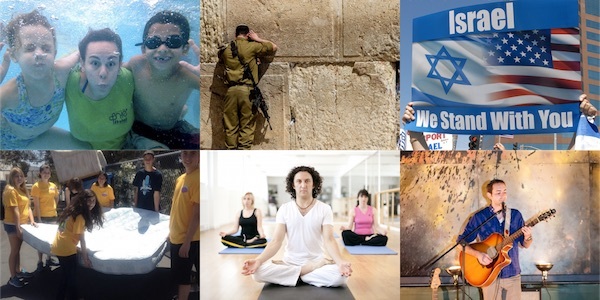 Unlike other crowdfunding platforms, Jewcer does not provide an “all-or-nothing” fundraising option. Whatever money we raise, we get to keep, regardless of whether or not we reach our target fundraising amount. In the event that the campaign fails to meet its goal, I will assess options based on how much has been raised. It is possible that with less than our goal amount, we may still be able to produce the film (by raising additional funds, getting grants, etc.) but perhaps not in our current anticipated timeframe, or perhaps with a leaner, less ambitious script. In the event that we raise significantly less than our target, I will make every reasonable effort to honor your contribution, although it might have to be through an altogether different project. If you are contributing at a level that grants you access to creative materials, or that invites you to provide feedback or visit the set, these are invitations to observe, and to participate as a lay-person. These perks do not obligate us to incorporate your suggestions, and if we do incorporate your suggestions, that will not cause you to become a stakeholder or owner of the production or any of its intellectual property. Although our invitation to participate through these perks is genuine and whole-hearted, we reserve the right to rescind that invitation if your actions or words threaten to undermine the integrity of the production, or cause distress to our cast, crew or associated personnel. If you contribute at a level that earns you a perk that includes a third-party company or organization, it is with the understanding that third parties are outside of our control. If third parties change their terms or go out of business, we will make an effort to substitute those perks with perks of equivalent value or significance . With gratitude, I can report that we’ve submitted this film to over 130 film festivals so far, and we’ve been selected by four (we’re waiting to hear back from roughly 120). There are a couple dozen more festivals that I’d like to send it to, but as of this moment, we’ve run out of money. If we win cash prizes, or if we can raise a little more, I’ll be able to submit the film to the rest of the festivals on the list. All the social media work you’re doing must be paying off! As of this moment, over $1000 of the contributed funds has come from people who don’t know anyone on the project! The PR push continues, of course, so as much as you can share the page with your friends and family, please continue to do so! And check out the new perk we just added: a guided coffee tasting! Many of you don’t know that I was trained as a Coffee Master back when I was a Starbucks barista – I even earned my black apron! I can come to you for the coffee tasting anywhere in the Greater Los Angeles area. Thanks again to all of you who’ve contributed either monetarily or by pushing the PR so thoroughly – over 1000 shares on social media is pretty amazing! Keep up the excellent work! We’ve crested the $5000 mark! You’re making this movie possible! Thank you! In recent days, we’ve added some incredible perks from the Ocean Institute in Dana Point, CA. 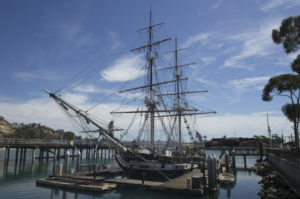 Someone has already claimed the Whale Watch tickets, but the private tour of the Brig Pilgrim is still available, as are the Tall Ships Festival tickets, and the big one: a private, catered dinner for 20 aboard the Brig Pilgrim, with entertainment by the Ocean Institute! And of course, it’s still critical that we all share this campaign with as many people as possible. The more folks know about it, the closer we’ll get to our fundraising goal. The first day of our “soft launch” has been very successful. Your contributions ranged from $18 to $360, and have boosted us over the $1000 mark, roughly 6% of the way to our goal! If you haven’t done so already, I encourage you to “like” our Facebook page, http://www.facebook.com/jewishpirates, and to share it with your friends. If you know of people who might be particularly inclined to come aboard this project, you can share the campaign page with them, too. But remember – no mass-emails or social media posts yet! I’m truly humbled and thrilled to see this early support for “The Pirate Captain Toledano”. I can’t wait to share the finished film with all of you! "The costumes greatly enhance the production"
"Be watching for you Dan"
"Hope to top off your campaign a little more"
"One last little push from our end. Arrrrrr(non), matey. So excited this will happen for you! xo, j & s"
"Have a great time with your new project"
"In honor of Ilana's birthday! Woot woot!" "Happy to support you, Arrrrnon. :-)"
"Happy to climb aboard, Captain!" "Have a successful movie making experience!" "In memory of Jonathan Schwartz"
"Dedicating this donation to more creative and happy things in the country and in the world :)"
"Mazal Tov on this wonderful endeavor." "We believe in this awesome film concept and can't wait to see it! xo, Jenn & Stew"
"In memory of Sarah bat Golda"
"Good luck! Can't wait to see the film!" "I hope I can see this film! It's great seeing your amazing work. Miss you!" "Good luck Arnon! Hope this wins an emmy and an oscar and if it can win a tony that as well!" "Arnon i am sooo proud of you !!! good luck !!!" "My your sails be full, and hull heavy with crowd funding bucs"
"I want to wish you all the best with this project"
"A great story. Hope to see it soon!" "Glad to support Arnon on this new project :)"
"In honor of Talia and Arnon"
"So excited!! We are rooting for you, arrrnon!" "Wishing you much success in this endeavor!" "go dan and cast/crew!!! make it happen!" "We love you! Rock this!!" Every doubloon helps! You'll get our tremendous gratitude, and occasional updates from the campaign. We like you twice as much as the stowaways! (no, we like you all the same, but the money will go twice as far to get this movie made!) You get our gratitude, updates, and a PDF of the movie poster before the film premieres! Eighteen is a powerful number in the Jewish mystical tradition. It stands for "life", and the first indication that a film has some "life" is the script. 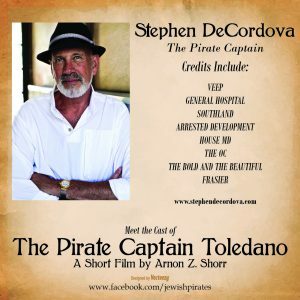 For your generosity at this contribution level, we'll share with you the TOP SECRET "Pirate Captain Toledano" screenplay. (By selecting this perk, you agree not to share the screenplay with anyone who hasn't also made the same or greater contribution to the project). If you really want to see the finished film, this is the perk for you. After our first Los Angeles area festival screening, we will put the film online, behind a password, and we'll give you a month to watch it as many times as you'd like! In addition to the "First Mate" perks, if you live in the greater Los Angeles area (including parts of Orange or Riverside Counties), I will come to your house and treat you (and up to five friends) to a coffee tasting! I received Coffee Master training at Starbucks, and was once able to differentiate between Latin American, African and East Asian coffees by taste. This is a great perk for you if you want it ALL! You get the PDF poster, the screenplay, the limited-time streaming access after the film's LA premiere, and if you give us your Facebook or Twitter handle, we'll thank you publicly for your generosity in social media! Gunning for some real recognition, aren't you? If you grace us with this level of generosity, we'll grace you with the PDF poster, the script, the limited-time streaming access after the Los Angeles premiere, social media recognition, and we will list you in the "Thanks" section of the film's end-credits! This is an EXCLUSIVE new perk! In addition to the "Master Gunner" perks, you will be granted access to an online ADVANCE SCREENING of the completed film, after which you'll have an opportunity to participate in an online Q&A with the director. On Pirate ships, the carpenter and the surgeon were often one and the same because the same tools were used for both jobs! For this much generosity, we've got to give you something you can really brag about. We will give you all the usual stuff: PDF of the poster, the script, limited-time streaming access after the LA Premiere, we'll give you social media recognition, we will list you under "Special Thanks" in the credits, and we will submit your name to IMDb when we post the film's credits info! Now we're getting to some truly special perks. For generosity of this magnitude, we really want to bring you into the inner sanctum of our project. You'll get all of the above perks, plus an opportunity to watch a rough cut of the film before it's finished, and to send YOUR notes to the director! This is a special one-of-a kind perk: In addition to all the regular "Sailing Master" contribution level perks (PDF of script, PDF of poster, Social media shout-out, Access to film online (for one month, after the LA Premiere), "Special Thanks" in credits and on IMDb, Opportunity to give feedback on the rough cut, Sea Star membership at the Ocean Institute) you also get two whale watching tickets from the Ocean Institute in Dana Point, CA! Okay, you really, really want to spend time with us on set? This is the perk for you. At this level of generosity, you're single-handedly covering most of our location expense, so of course, in addition to all those other perks (PDF Poster, script, video, gratitude) we'll credit you as "Executive Producer" in the credits and on IMDb, and you'll be invited to join us on set during production! We'd be silly not to invite you to see what magic and wonder you're enabling! (At the moment, we're looking to shoot on a pair of amazing tall ships in Dana Point, California - wherever we shoot, you'd have to get yourself to and from set, as we can't cover transportation costs) You will also receive a Sea Star membership to the Ocean Institute in Dana Point, CA. This is a really special perk that comes courtesy of the Ocean Institute in Dana Point, CA. In addition to the regular Ship's Captain perks, you will get a CATERED DINNER FOR 20 aboard the Brig Pilgrim, one of the beautiful tall ships at The Ocean Institute. The dinner comes with some entertainment for the kids (and kids-at-heart), and we're even working on making a Kosher caterer available. This perk needs to be scheduled with the Ocean Institute, and does not include transportation.